VW will use Nvidia technology to develop intelligent co-pilot systems for future autonomous vehicles such as the I.D. Buzz minivan. SAN FRANCISCO -- Volkswagen Group and Uber Technologies will use Nvidia's artificial intelligence expertise to help bring self-driving cars to the roads as the tech company tries to spread its industry-leading chip technology into new areas. Volkswagen will deploy Nvidia technology to develop an intelligent co-pilot systems for future autonomous vehicles such as a minivan based on the I.D. 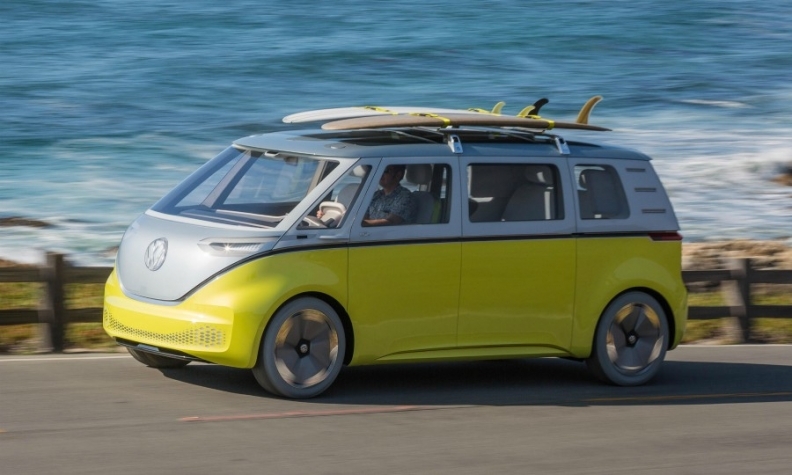 Buzz concept, the automaker said in a statement on Monday. Uber, the largest ride-hailing company, will use Nvidia processors and software for its forthcoming fleet of self-driving vehicles, the chipmaker's CEO Jen-Hsun Huang said at the CES consumer electronics show on Sunday in Las Vegas. Huang was joined on stage by Herbert Diess, VW brand chief. Nvidia is touting the tie-ups as a way of claiming leadership in the growing competition among component makers for whose technology will dominate the emerging field of self-driving cars. Rival chipmakers such as Intel and Qualcomm have also said their technology will be the key ingredient in new systems. Meanwhile automakers have announced collaborations with multiple companies as they try to work out what's the best way to remove the need for drivers. "The map is almost everyone working with everyone," said Danny Shapiro, who heads Nvidia's automotive business. "We're happy with our position, with the 320 partners we have." Volkswagen and Nvidia's co-piloting system will provide convenience and assistance features using sensors inside and outside the vehicle. The artificial intelligence capabilities will improve the system over time. Such features may include the ability to recognize when a driver is drowsy or distracted and keep the car smoothly running in the proper lane at the right speed for the conditions. Uber has been working on self-driving car trials since 2015 and has completed 50,000 passenger trips over 2 million autonomous miles. Uber began using Nvidia chips in its first test fleet of Volvo SUVs, the companies said. The companies didn't provide financial details about the partnerships.